When NBC announced it would be rebranding Versus as the NBC Sports Network, some people thought it might be able to rival ESPN as the nation's premier 24-hour sports network. Well, so much for that. Aside from the NHL, NBCSN doesn't have broadcast rights for any major sports. 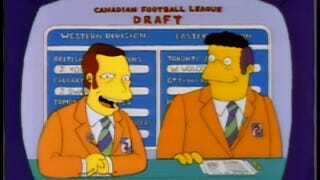 That's about to change, though, because here comes the CFL. Starting August 27, NBCSN will show 14 CFL games, including the 100th Grey Cup. The NFL Network showed a few games during last summer's lockout, but when the labor dispute ended, so did any faint American interest in 12-man football. The move could work out well for NBCSN, though. Canadian football is just recognizable enough to Americans for them to understand what's going on, with enough little quirks that the novelty will attract a few viewers. Sadly, no matter how much Canadian football you watch, you'll never see anything like this again.